Amelia's most striking aspect is it's side column layout. This side column hosts some of the primary elements of your site including the logo and main navigation. Also included is some social icons and copyright information, all easily set from within the template settings. Of course you may wish to include your own custom elements. For this we have included some module positions to which you can assign the modules of your choice. By default the sidebar has a fixed position however this to can be set to scroll with your website content via the template settings. Settings to set the sidebar width and color are also included. To help populate your site we have also included a number of useful module extension. These modules allow you to quickly and easily create various UI elements quickly and easily. These modules include a slideshow with captioned images, a thumbs gallery, a content carousel and a latest news feed. Putting your own unique stamp on your website design is important. With the Amelia Joomla template we have ensured that every aspect can be easily styled with a host of color and typography settings. Check out the example styles menu item on the template demo to get a taste of what the limitless possibilities. 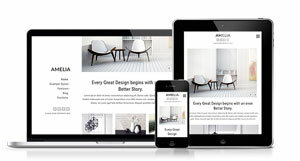 With modern website design we believe that your site content should look it's best on every device. As with all Joomla51 templates we have taking every measure to ensure that your site content will flow perfectly across every device and screen size with minimal ease. Get started on a new web design adventure with Amelia!